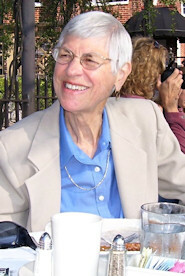 Longtime EEWC member Dr. Ruth Schmidt died May 24, 2010 in Atlanta, Georgia. She was 79 years old. Ruth wrote one of the earliest articles on the equality of women and men and always worked for women’s empowerment. 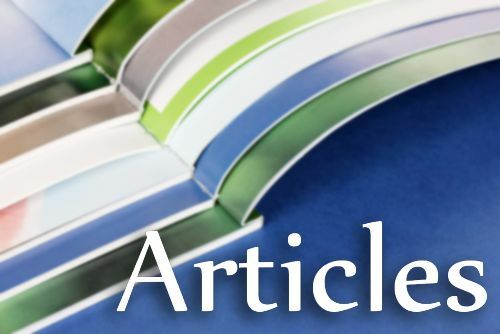 Her article, “Second-Class Citizenship in the Kingdom of God” was published in Christianity Today in 1971 and was later reprinted in Ginny Hearn’s book, Our Struggle to Serve. Ruth’s personal story is also told in that book. Among the eight (out of fifteen) members of the original EEWC council who were able to attend the first official council meeting in December 1978 were (left to right): Back row: Florence Brown and Ruth Schmidt. Front row: Ann Ramsey Moor and Karen Berns. The meeting was held in Coventry, Connecticut. Ruth’s greatest service to the Evangelical & Ecumenical Women’s Caucus was in our infancy. She chaired the committee that wrote our original By-Laws. And then she presided for several hours over the1978 business meeting in Pasadena, CA, at which our initial Statement of Faith and By-Laws were passed and our first National Council nominated (they were to be elected over the following few months). Despite the fact that Ruth had learned that morning that her father had died in Minnesota, she led the lengthy meeting with a steady hand, clear voice, and her usual grace. 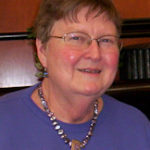 Ruth was also instrumental in founding the Greater Boston chapter, according to her long-time friend Barbara Gifford, who would later serve on the National Council and as Co-Coordinator at the crucial 1986 Fresno conference. They first met at the New England Association of Evangelicals where Ruth gave a presentation on biblical feminism. 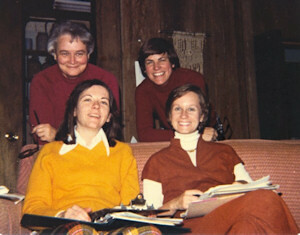 Ruth, Dorothy Meyer, and Barbara took the lead in forming the Boston chapter shortly after the 1980 EEWC Conference held at Saratoga Springs, NY. 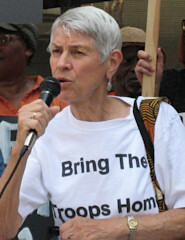 Ruth’s commitment to peace also influenced Barbara and other EEWC members to join her in a bus journey from Boston to New York City’s Shea Stadium for an anti-war rally. 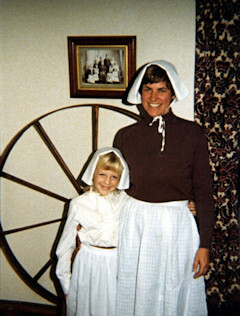 Ruth with her goddaughter, Catharine Hannay, in Pilgrim costumes for Thanksgiving (1975). Ruth herself was elected as an at-large member of the National Council. Composed of ten chapter representatives and five representatives-at-large from across the United States and Canada, the Council met in early December 1978 to plot the organization’s future. Ruth had been instrumental in founding the Albany, NY, chapter, represented on the council by Margaret Hannay. Joan Baer and Mary Miner of the Albany Chapter also took responsibility for publishing the EEWC newsletter. Ruth served on the Council nominating committee. Born September 20, 1930, in Minnesota, Ruth was a graduate of Augsburg College. She received an M.A. in Spanish from the University of Missouri and a Ph.D. from the University of Illinois. She began teaching high school Spanish and English in Minnesota, then went on to teach Spanish at Mary Baldwin College in Virginia. 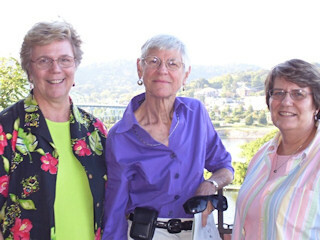 Ruth (center) celebrated her 75th birthday with her friends Jean Wright (L) and Barbara Gifford (R). She joined the State University of New York at Albany as an assistant professor of Spanish and eventually became Dean of Humanities. She then served as provost and professor of Spanish at Wheaton College, a women’s college in Massachusetts, from 1978 to 1982, before completing her career as president of Agnes Scott College in Decatur, GA, a suburb of Atlanta, from 1982 to 1994. At a celebration of her life held in the chapel at Agnes Scott on June 16, she was remembered as the women’s college’s first female president and as an advocate for campus diversity and international study. Ruth at the microphone, speaking out for peace. Ruth Schmidt enjoying her 75th birthday celebration. In her childhood, Ruth’s family was very involved in the Christian and Missionary Alliance Church. In Atlanta she was a faithful member of North Decatur Presbyterian Church. Always a serious Christian, in retirement she participated in Columbia Theological Seminary’s certificate program in Spiritual Formation. She completed the program’s series of retreats, classes, and a pilgrimage to Iona in Scotland. At a service on May 27 at her church, participants sang a Taizé song “Nada te turbe,” based on the words of the Spanish mystic and saint Teresa of Avila. It ends with the phrase “Solo Dios basta,” “God alone fills us.” At Ruth’s request, the service included Holy Communion. Her niece Lorene Brown asked that there be doves. As she released three of them after the service, she named them “peace, freedom, and resurrection.” Surely Ruth would have been pleased. As they returned to their covey, so she had returned to the presence of the Holy One she had served so faithfully. Her sisters and brothers in EEWC are grateful for her presence among us and the gifts of wisdom and grace with which she blessed us. We will miss her. Hanson raises important questions about the traditional reading. She points out that we read into it things that aren’t actually there. For example, we assume that Jesus and twelve other tired, hungry men showed up on Mary and Martha’s doorstep unannounced. Any decent host would be alarmed. But the passage doesn’t state that any other disciples were present.